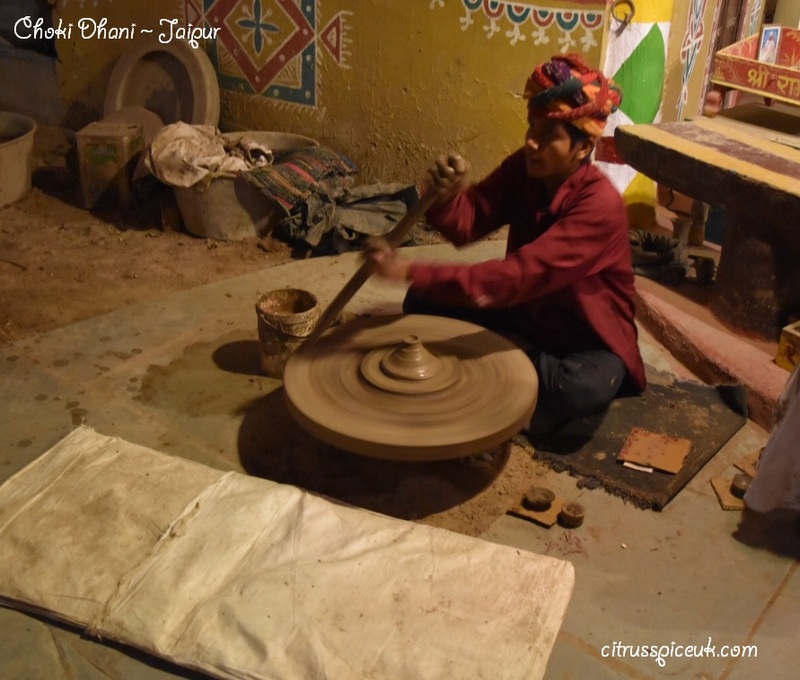 On my recent blog post in my India travels series, I wrote about my trip to Jaipur, one of the highlights of the trip was to Choki Dhani, a rural village setting decorated with traditional artefacts and furnishings and serving Rajasthani cuisine in a very authentic and homely way. We enjoyed the village atmosphere and the Rajasthani ambience which was created by performances of traditional Rajasthani dance. The dancers balanced stacks of pots on their heads whilst standing on steel tumblers. the sheer balancing and dancing to rhythm was mesmerising. 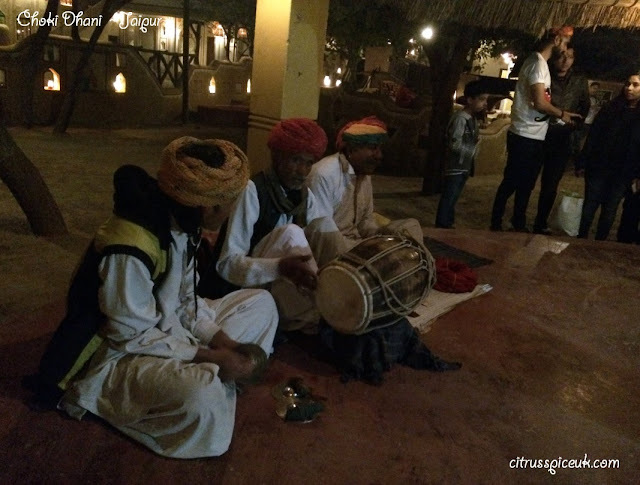 The Melody and tunes orchestrated by Rajastani musical instruments was very authentic and folklore musicians were really good as they performed folk songs . 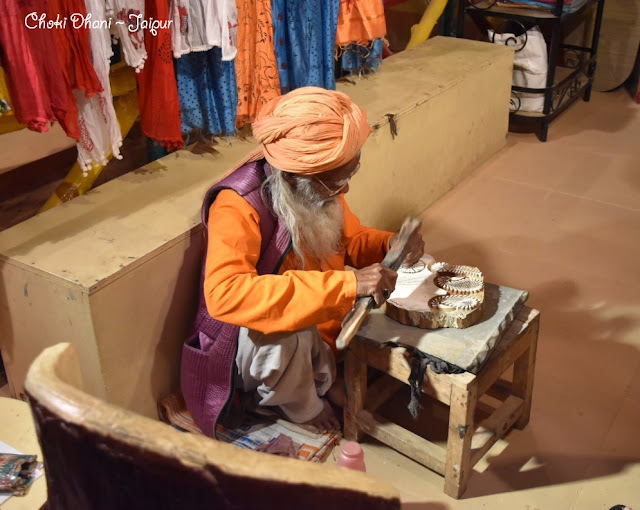 There were many stalls selling ethnic wear, hand crafted bags, shoes and regional mirror work clothing. 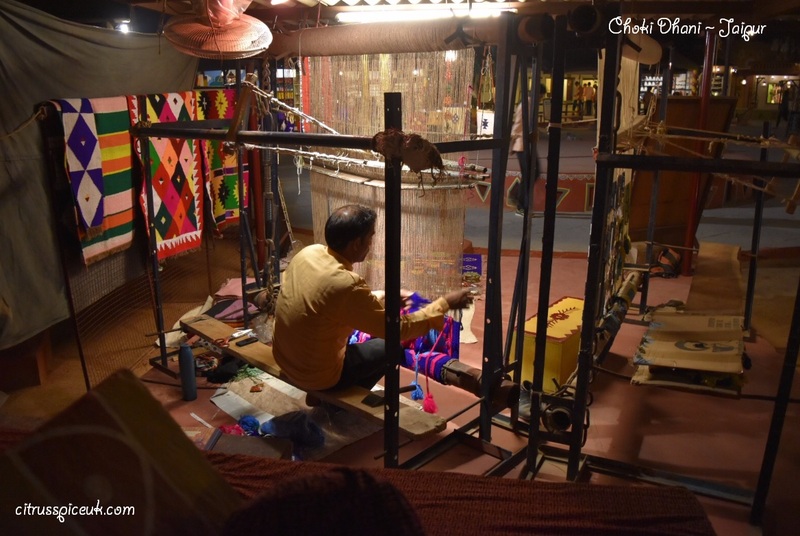 We particularly liked the fact that many old trades of carving, weaving, printing etc were showcased at Choki Dhani, not only did it give tourists like our selves an insight to these fascinated trades but it also kept the livelihood of these tradesmen alive. 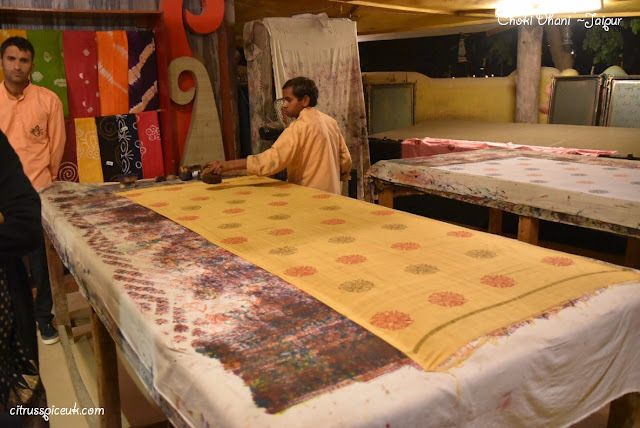 At Choki Dhani we were able to see the art of carving printing blocks by local artisans and later saw the blocks being used to print fabric with fabric dyes. The designs were intricate and beautiful. We were able to participate in making our own pot using a hand turned pottery wheel. It was wonderful to see that the age old art of pottery was being promoted and kept alive. 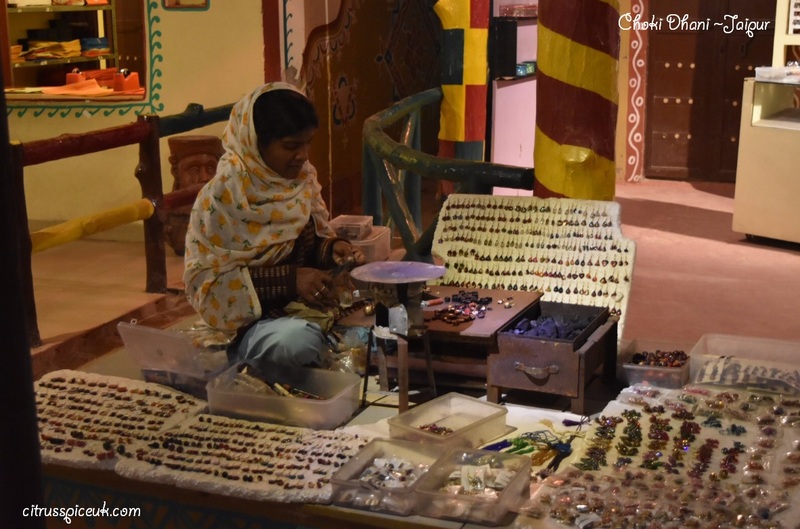 Lakh (glass) bangle making and handmade glass jewellery was also on show at this place. The glass beads were hand made as were the Lac (glass )bangles bangles. 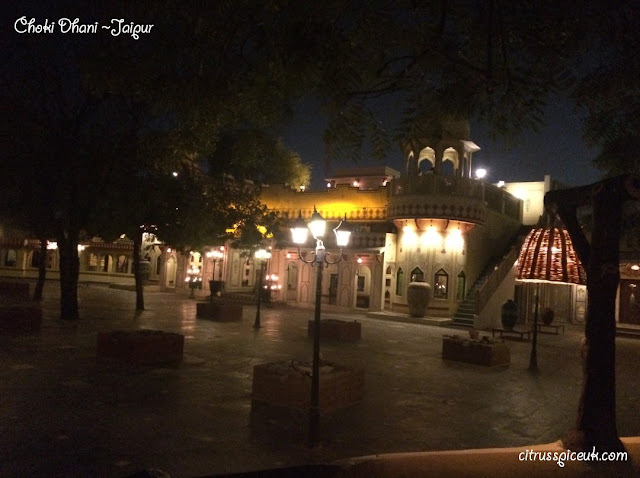 Jaipur is well known for its thread work embroidery, mirror work on bags and clothing and also for hand weaved rugs. The beautiful and colorful rugs were each hand weaved as the weaver laboriously weaved thread after thread to make intricate designs on the hand loom. 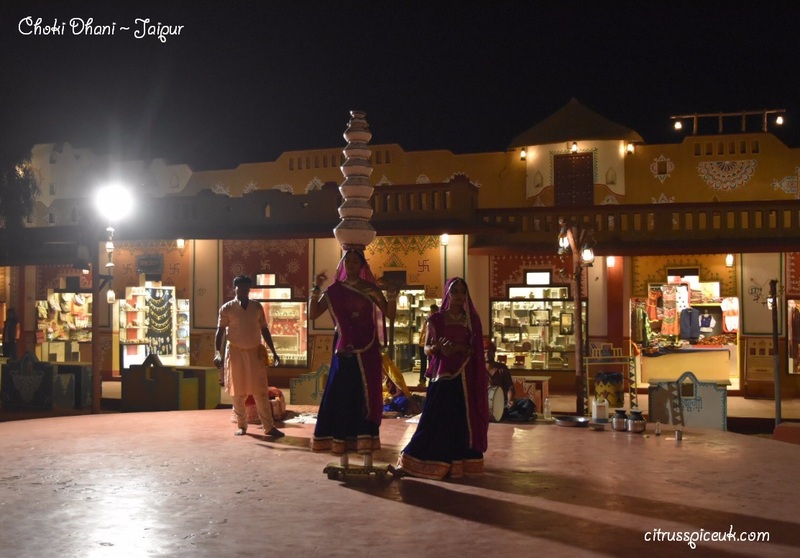 There were many stalls where you could sample Rajastani snacks and cuisine, and participate in magic shows, and join in some Rajasthani games also. Finally to complete our experience we enjoyed a wonderful Rasthani Thali (platter of food) at the Choki Dhani restaurant which again was an experience in itself. After being grandly escorted like VIP guests to the courtyard restaurant we were invited to sit on the floor cross legged on plush cushions. 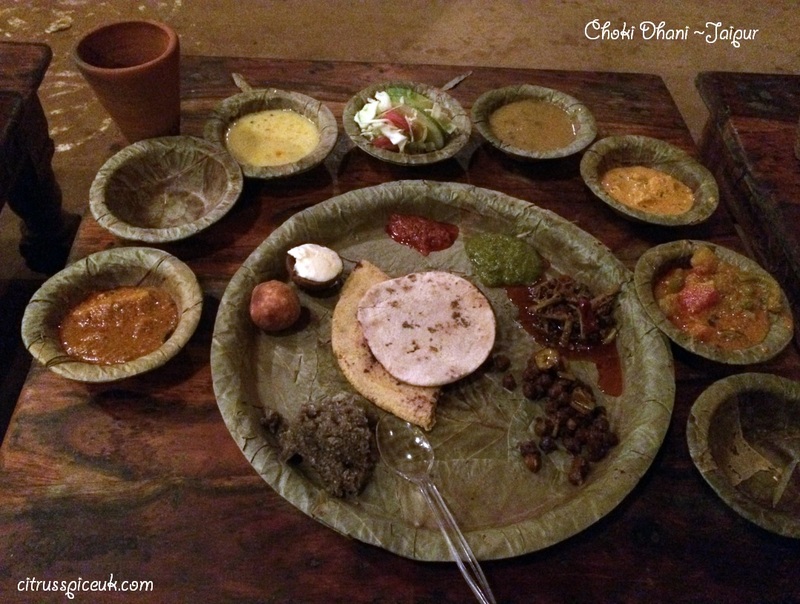 The waiters served a large selection of traditional Rajasthani cuisine on banana leaf plates and bowls set on low tables. 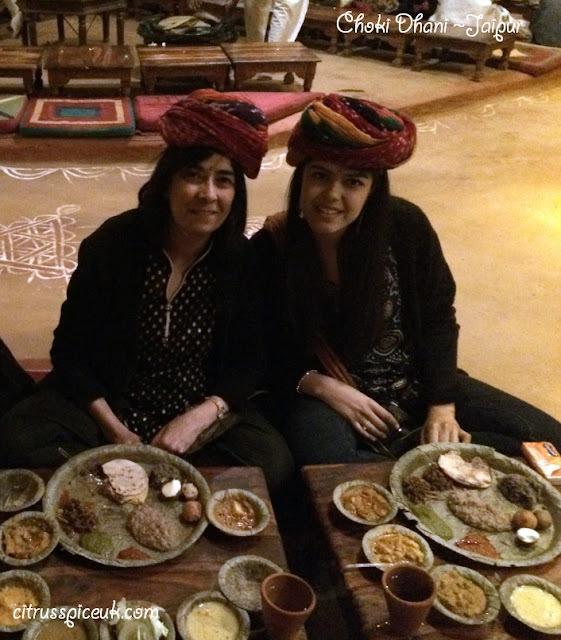 We adorned Rajasthani turbans as we enjoyed our food. The food was delicious and plentiful and it just kept coming, It was indeed a rich gastronomical experience and one I WILL NEVER FORGET!!! 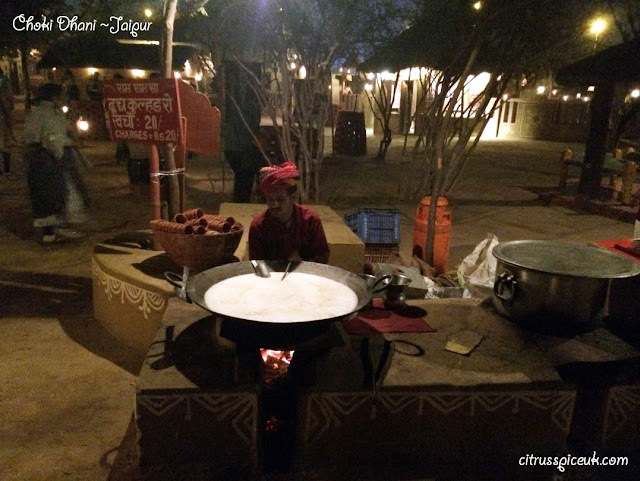 Guests can also check in and stay at the Choki Dhani resort, which I believe is magnificent , however we already had our rooms booked at the Hilton and so did not have the opportunity to stay there. 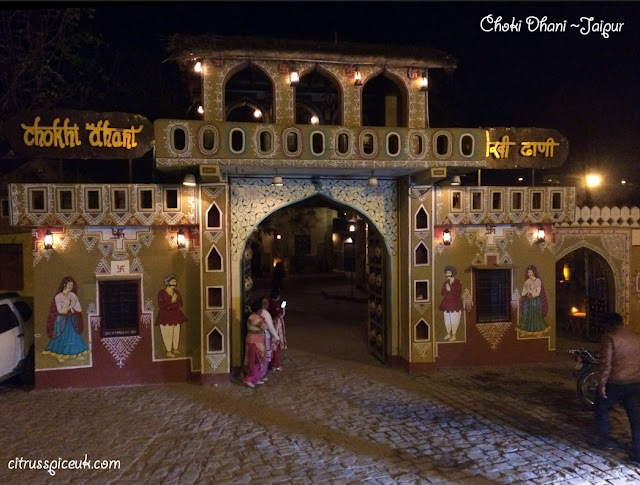 If you want to see and experience an authentic Rajasthani cultural experience, I would highly recommend a visit to Choki Dhani. 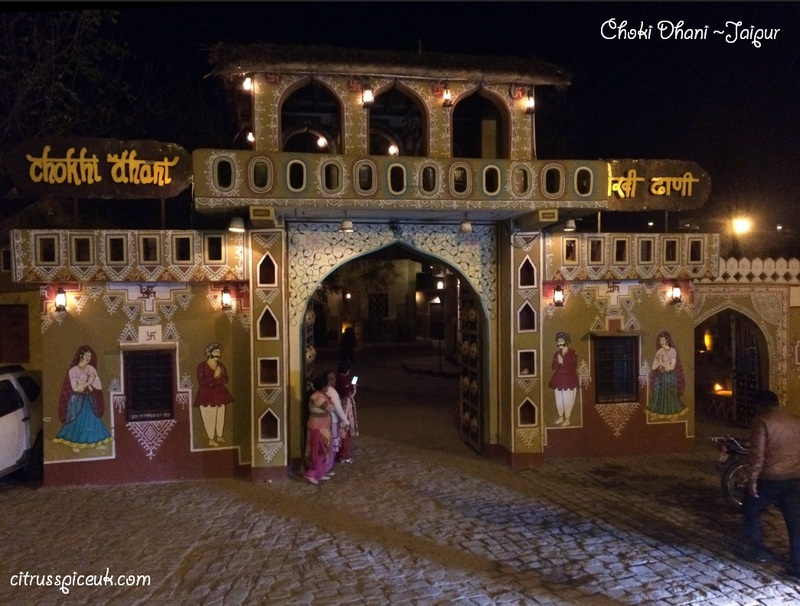 Your post reminded me our trip to choki Dhani, beautiful place with great atmosphere. We enjoyed every moment of it, seems like you had great fun too. What an amazing place! 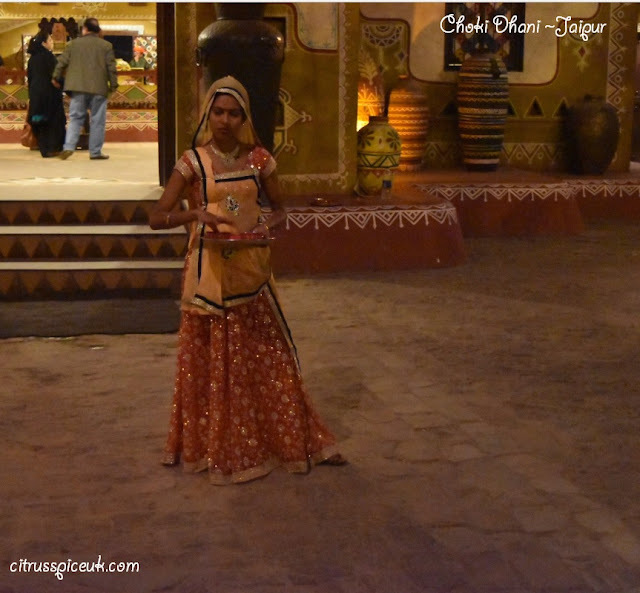 Full of so much culture, you've captured it perfectly in your pictures. Those food platters look incredible as well! I had visited this place many years ago.. your pictures brought back sweet memories. We had a camel ride too... and the Rajasthani meal was a treat indeed ! It sounds like such an incredible place and once I can tell you are not going to forget Ina hurry. What an amazing adventure. I love to discover new places and hear about different cultures. It's so important in life. It's a small world! Great share. I like these types of photos much more than when people are shooting buildings and landscapes because they are much more "in it". This makes the whole experience to me as a viewer/reader much more "personal" in a way. Even though I obviously wasn't there. sounds like a great trip and what beautiful photos you have - love finding out about new cultures! Hi, it looks like a delightful village to visit. How does that lady balance all of that on her head? The food looks delicious. Wow, that's really incredible that the ladies can dance with that many pots balanced on their heads. It must be quite an expert watch! I've never been anywhere even close to India :( Would really love to visit. Your photos give me Wanderlust! Nicely covered, surely a good hangout option, food is amazing and its a total family place. I;m dreaming of the day when I'll manage to come and visit India. I've read so many things about its culture and traditions, I've seen so many pictures with amazing landscapes but never got there. It happens that just few hours earlier I saw the movie "Taj Mahal" and I was impressed what luxury hotels are there. Beautiful country. I have always wanted to go to India. It looks so nice. I would love to visit India! It looks so interesting and lots to see and different food to try :) I bet the dancers and music was amazing. Oh wow, those photos look amazing and it really looks like you have been immersed in culture when visiting Jaipur. I love India! Reminds me of the book "Eat, Pray and Love!" Wow this is an amazing adventure to do! Eat like a loco is always cool! And in the middle of the dancers and artisans is top! Your trip looks incredible! Definitely part of the world that I would love to visit. oh wow. This looks like an amazing place to visit. I really would love to go here and it is so authentic too! It looks a stunning place <3 Embroidery work, meals and everything is so gorgeous. Stunning! So much colour and culture. Sounds like a trip of a lifetime. From your pictures, it sure look like a nice place to visit. This village looks so colourful. And I would so love to try the food! Sounds like an experience of a lifetime. Sounds wonderful.